Suggested inquiry questions: How did enslave Africans fight for their freedom from plantation owners? Potential activities: Consider the Abolition Act of 1807 in regards to this and other rebellions. Many Africans also showed their resistance through rebellion. The most successful rebellion took place in Haiti in 1791. Here, the enslaved population drove out the French and British and set up the first black republic. In Jamaica, a group of Maroons, or runaway Africans, formed their own settlements in the mountains. For the next 150 years they fought against the British and helped to free others. Slave rebellions tended to be less threatening in Barbados than on other Caribbean islands. Barbados had a well-armed police force and there was nowhere to hide. Unlike Jamaica, which still had forests, most of the land in Barbados had been cultivated to produce as much sugar as possible. On Sunday 14 April 1816 a major rebellion broke out in Barbados. This rebellion was carefully planned and organised by the senior enslaved men and women who worked on several estates and plantations. 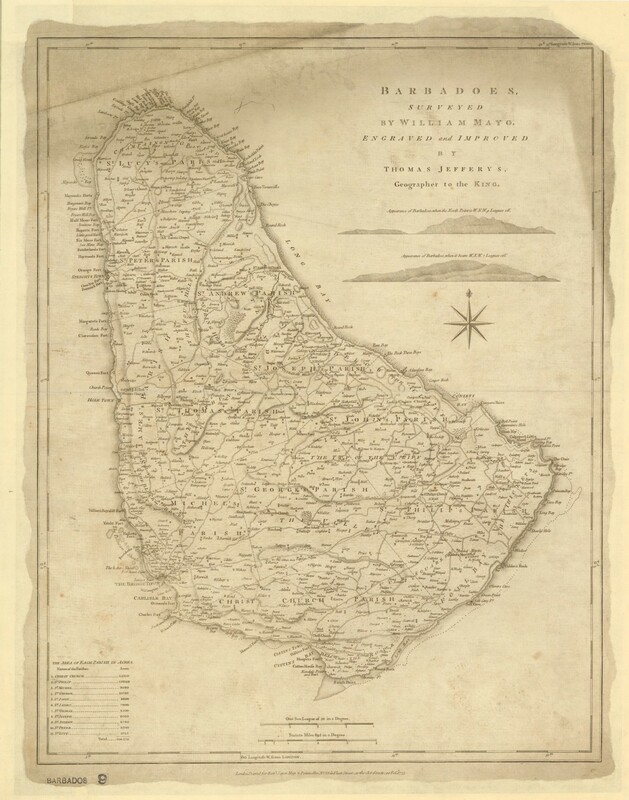 The rebellion started in the evening in the southeast parish of St Philip, spreading to most of the southern and central parishes of Christ Church, St John, St Thomas, St George and parts of St Michael. Three days later it was put down by the local militia (soldiers) and the imperial troops (the King’s troops) stationed on the island. Martial law (army rule) was declared on Monday 15 April, and was lifted on 12 July. 1. Read Source 1. This is a letter from James Leith, Governor of Barbados, to Earl Bathurst, Secretary of State for War and Colonies, 30 April 1816. What evidence is there in this source that these events are viewed as serious? 3. Read all parts of Source 3. This is an extract of a private letter, St Ann’s, Barbados 27 April 1816. What is the attitude of the writer to the insurgents? How many men were killed on both sides? 4. Read both parts of Source 4. This is a letter from Colonel Edward Codd to James Leith, his report of the insurrection, 25 April 1816. What was the cause of the rebellion according to this report? An African-born enslaved man called Bussa led the rebellion on Barbados. Very little is known about him, except that he was a ranger at the Bayley plantation in St Philip. A ranger was the head officer among the enslaved workers on an estate. He would have to look after boundaries and fences and deal with the day-to-day business arising between the estates. This meant that rangers travelled throughout the area. It is likely that Bussa enjoyed the confidence and respect of both the black community and plantation owners. Bussa planned the uprising with people from the different estates. This included Jackey, the driver at the Simmons estate, King Wiltshire, a carpenter at Bayley’s and Nanny Grigg, a literate domestic at Simmons. The uprising started at Bayley’s estate. It was an attempt by the enslaved people to change the society on Barbados. They believed that Barbados belonged to them and wanted their freedom from the plantation owners. The act to end the slave trade had been passed in Parliament in 1807. In 1815 the slaves thought that they were going to gain their freedom when Governor Leith returned from Guadeloupe, another Caribbean island. They believed that he was bringing a ‘free paper’ with him to set them free. Bussa commanded about 400 men and women against the troops. These included the West India Regiment, an all black branch of the British Army. He was killed in battle and his troops continued to fight until they were defeated by superior firepower. One white civilian and one black soldier were killed during the fighting. Compared to this, 50 enslaved people died in battle and 70 were executed in the field. Another 300 were taken to Bridgetown for trial, of which 144 were executed and 132 sent away to another island. Bussa’s rebellion was one of many rebellions that took place in the Caribbean over the centuries, showing black people’s determination to gain their freedom. Rebellion was their attempt to influence the abolition movement. This lesson can be used with key stage 3 pupils in year 9. It looks at the story of the Bussa rebellion on Barbados based on evidence relating to the reaction of the British authorities. Source 1 provides evidence of the outbreak of the rebellion. Methods of social control used by the authorities are evident in the source. Source 2 shows what happened during the rebellion and the attitudes of the authorities. Source 3 reveals more about the attitude of the authorities and the course of the rebellion. Source 4 provides evidence from a report into the causes of the insurrection from the point of view of the authorities.